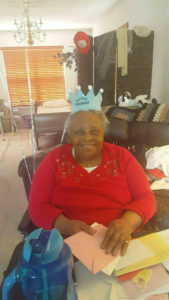 Mrs. Frances M. Murrell, age 91 of Smithfield died Friday February 16th at Duke Medical Center. The family will receive friends Friday Feb. 23rd from 4:00pm until 7:00pm at the Walter Sanders Funeral Chapel 302 S. Bright Leaf Blvd Smithfield. Funeral will be held Sat. February 24th at St. Mark AME Church 409 Bridge St Smithfield. Viewing from 11:00am until 12:00 noon. Funeral Services begins at 12 noon. Arrangements by Walter Sanders Funeral & Cremation Services of Smithfield.